To meet the global demand of cleaner and fuel efficient vehicle, automakers are investing millions in electric vehicle technology. This shift will produce efficiency and environmental benefits. Regenerative Braking is one of key features of powertrain of Electric and Hybrid Vehicles like Tesla Roadster, Mahindra E20, and Toyota Prius etc. An energy recovery mechanism, which converts vehicle’s kinetic energy into chemical energy stored in the battery. So, when brakes are applied the energy which could be lost is utilised in charging the batteries. EV’s are new types of car introduced in Indian Market. These cars are propelled by electric motor powered by rechargeable battery packs. The electric motor that drives the car’s wheels plays a major part during braking. When the brake pedal is pressed, the regenerative braking circuit switches the motor so that it now operates in reverse to counter the direction of the wheels. This reversal makes it perform like a power generator or dynamo that produces electrical energy. The electricity developed is routed towards the car’s storage batteries to recharge them. 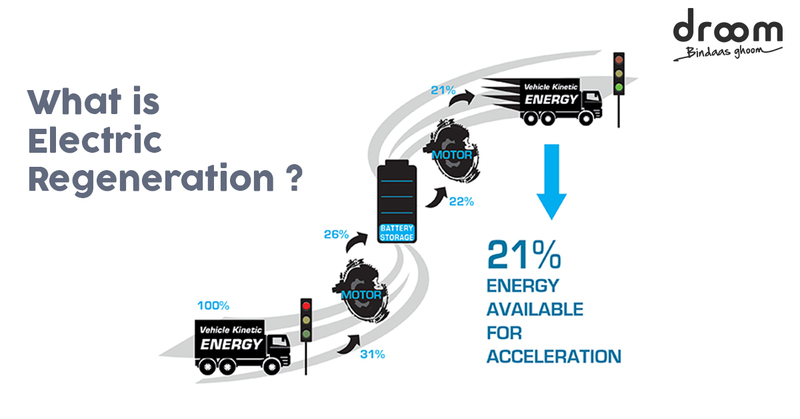 This system can dramatically enhance vehicle’s fuel efficiency. In today’s world rising fuel cost and environmental problems is a major concern of buyer. This system tries to utilize energy efficiently and reduces carbon footprint. It increases the range of electric vehicles and makes it suitable for everyday use. KERS,(Kinetic Energy Recovery System)is used in Formula 1 cars to provide an instant power boost that can be most useful for overtaking manoeuvres. This works on the same principle. As the technology evolves, regenerative brakes will get better and we’ll be able to feel green every time we step on the brakes.